(PERFECT) PRACTICE MAKES PERFECT: Becoming an excellent writer! This old saw applies to writers as much as to musicians. The reason why most people who shop their manuscripts don’t get published is because their writing isn’t very good. Agents and editors are looking, above all, for excellent writers. But how do aspiring writers set about achieving excellence? Research scientists have, for decades, been interested in the question of what makes certain people really good at what they do. To find the answer, they have studied high achievers in many different fields: music and firefighting, chess and golf—even writing. Most of us are sure we already know why some people are great in their field: Talent – that mysterious quality given at birth to the fortunate few. Wrong. In study after study, researchers find that innate talent is not a prerequisite for success and that hard work alone does not make people great. While successful people—those who achieve excellence in a domain—do work very hard, it is how they work that distinguishes them from others. Just putting in hours at your chosen work is not enough; the only way to get better is to make sure you’re devoting those hours to what we call deliberate practice. Most of us think that we know what practice is. We learned to play basketball and we remember practicing our jump-shot. We learn to play the piano and we practice scales. It is unlikely, however, that what we have done and are, at present, doing is really “deliberate practice” and it is almost a certainty that we have never applied the concept of deliberate practice to improving our ability to write. When most people practice, they repeat things they already know how to do. Those who become experts in their field spend most of their time doing things they don’t already know how to do. They are constantly challenging themselves to improve, to do things better, to gain additional skills. Deliberate practice demands reaching for objectives that are always just out of reach and the practitioner knows that the only way to achieve those objectives is through immense amounts of repetition. Why? Because we learn how to write in school, where writing is always done under “performance” conditions: the writing will be read, assessed and graded. Even in most creative writing workshops and writers’ groups, the focus is on performance writing. The writer is taught to write something good enough to get published. The problem with this approach is that it’s impossible to learn your skills and to improve them if you never give yourself a chance to practice. Most aspiring writers are doing themselves a great disservice by focusing on trying to write publishable pieces. These writers simply don’t have the skills they need to produce professional-quality work. Instead of trying to get published, they need to devote themselves, at least for a while, to practice. Writers need to possess two main sets of skills: “Content Skills” and “Craft Skills”. One of the keys to deliberate practice is to break a complex skill down into component parts and practice each part separately. To begin, write down all the writing skills you presently have. Are you good at coming up with ideas? Do you have a well-trained ability to do research? Does your imagination give you vivid, detailed pictures? Are you good at finding wonderful words? Next, write down all the skills you need to learn or to work on. If you are just getting started with writing, you may find this difficult. If people have made comments on your writing, you can use those comments to make your list. If, for instance, you have been told that your characters are not believable or your descriptions are fuzzy, then the skills of creating characters and writing descriptions go on your list. Read a piece of writing by your favorite author. Now, write down all the things that writer does that make the piece so good. How many of those things can you do now? How many of them do you need to learn how to do? Your answers to these questions will tell you what you need to practice. To get the most benefit from practice, keep these two principles in mind: repetition and reflection. Repetition – lots of it – is required to make skills automatic, so that when you sit down to write your novel those skills are ready to work for you. Reflection – What did I learn today? What do I need to learn next? – is what keeps you on track in your pursuit of excellence. I once asked my students to define “creativity”. None of them could. I asked them to draw what creativity means to them. A few could; most could not. I believe the reason is because – in the U.S. and the U.K. (and I suspect all of the Western World) – creativity is looked at as purely the stuff of “dreamers” who want to pursue artistic endeavors and not “real work”. This is farther from the truth than the world being flat, but many take this view and discourage others from accessing what they believe to be an excuse for slacking off or avoiding reality. In actuality, creativity is the process of producing something that is both original and worthwhile. Creativity is about finding new ways to solve problems and approach situations. Creativity is not a skill restricted to artists, musicians or writers; it is a useful skill for people from all walks of life. The first step is to fully devote yourself to developing your creative abilities. Do not put off your efforts. Set goals, enlist the help of others and put time aside each day to develop your skills. One of the best ways to develop creativity is to become an expert in that area. By having a rich understanding of the topic, you will be better able to think of novel (pun intended) ideas and innovative solutions to problems. One common roadblock to developing creativity is the sense that curiosity is an indulgence. Rather than reprimanding yourself, reward yourself when you are curious about something. Give yourself the opportunity to explore new topics. Insecurity in your abilities can suppress creativity, which is why it is important to build your confidence. Recognize your progress, commend your efforts and always be on the lookout for ways to reward your creativity. You won’t be able to develop your creative talents if you don’t make time for them. Schedule some time each week to concentrate on some type of creative project. According to a 2006 study published in the Proceedings of the National Academy of Sciences, positive moods can increase your ability to think creatively. According to Dr. Adam Anderson, senior author of the study, “If you are doing something that requires you be creative or be in a think tank, you want to be in a place with good mood.” Eliminate negative thoughts or self-criticisms that may impair your ability to develop strong creative skills. Brainstorming is a common technique in both academic and professional settings, but it can also be a powerful tool for developing your creativity. Suspend your judgment and self-criticism, then write down related ideas and possible solutions. The goal is to generate as many ideas as possible in a relatively short span of time. Next, focus on clarifying and refining your ideas in order to arrive at the best possible choice. When you approach a problem, look for a variety of solutions. Instead of simply going with the first idea you have, take the time to think of other possible ways to approach the situation. This simple activity is a great way to build both your problem-solving and creative thinking skills. Start keeping a journal to follow your creative process and track the ideas you produce. A journal is a great way to reflect back on what you have accomplished and look for other possible solutions. This journal can be used to save ideas that can later serve as future inspiration. The “six hats” technique involves looking at a problem from six differing perspectives. By doing this, you can produce more ideas than you might have had you only looked at the situation from one or two points of view. Red Hat: Look at the situation emotionally. What do your feelings tell you? White Hat: Look at the situation objectively. What are the facts? Yellow Hat: Use a positive perspective. Which elements of the solution will work? Black Hat: Use a negative perspective. Which elements of the solution won’t work? Green Hat: Think creatively. What are some alternative ideas? Blue Hat: Think broadly. What is the best overall solution? Never expect creativity to just happen. Look for sources of inspiration that will give you fresh ideas and motivate you to generate unique answers to questions. Read a book, visit a museum, listen to your favorite music or engage in a lively debate with a friend. Utilize whatever strategy or technique works best for you. When you develop a new project, create a flow chart to track the presentation of your project from start to finish. Look for various paths or sequences of events that might occur. A flow chart can help you visualize the final product, eliminate potential problems and create unique solutions. If all this sounds like a lot of work—well, it is. Becoming a skilled athlete or musician is a lot of work. Did you think becoming a skilled writer would be any different? However, if you love to write – if you love it as much as Stevie Wonder loves to create music or as much as Michael Jordan loved to play basketball – then practice becomes a kind of dedicated play; a source of pleasure and fulfillment. If you are willing to shift your focus from getting published to becoming an excellent writer, then there’s a very good chance that, eventually, your skills will take you to the “big leagues” of the writing world. Just remember – practice does not make perfect…perfect – or deliberate – practice makes perfect; so, work diligently, but also work deliberately – to bring about the results you seek. 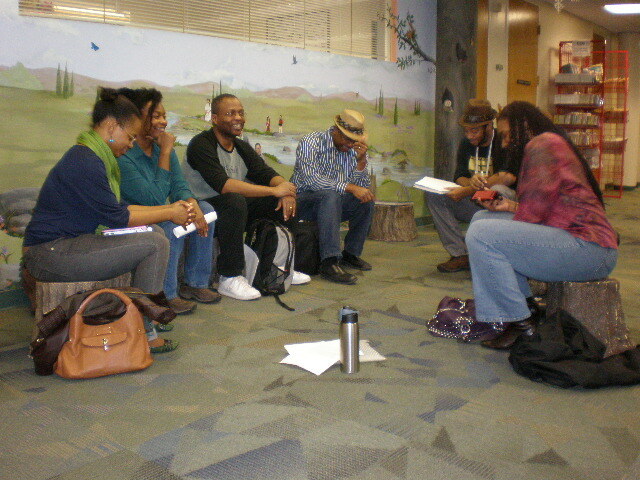 Posted by Balogun on March 24, 2012 in atlanta, Panel Discussion, Speculative Fiction, Writers Workshop and tagged african, afrikan, balogun, black, black speculative fiction, speculative, writers.